After her 38-year-old husband Michael suddenly died of cardiac arrest Sept. 17, 2009, Michelle Gable learned that he had hypertrophic cardiomyopathy (HCM), which could have been detected with a screening. Then just two weeks later, her baby daughter Grace had a cough that kept worsening and doctors found she was suffering from an enlarged heart. Grace spent her first birthday in the intensive care unit and was diagnosed with dilated cardiomyopathy (DCM). Gable became determined to alert others to these hidden dangers and help provide screenings to detect such heart defects before they proved fatal. She and her friend Amy Mayo — whose husband Stefan was in the band Segue with Michael Gable — founded the nonprofit Gable Heart Beats to work toward these goals. “We knew Michael would want to save lives. And we wanted to honor him,” Mayo said. Tomorrow, 200 young soccer players from Pleasanton RAGE and Ballistic United will receive EKGs and echocardiograms at the Amador Recreation Center, thanks to Gable Heart Beats. HCM, an excessive thickening of the heart muscle, is the No. 1 cause of sudden cardiac arrests in young athletes, Mayo said, and it affects more than 600,000 people in the United States. Although Michael and his baby daughter Grace didn’t have the same cardiomyopathy, the conditions are related and hereditary. Son Matteo, 10, has been tested and is negative. For those who test positive, it is often possible to improve the condition with medications, as in Grace’s case, said Michelle Gable. Mayo said that the first thing they did after establishing the foundation was to look for others with the same goals. They located Holly Morrell in Laguna Beach, who pioneered the grassroots cardiac screening effort in 1999 with her Heartfelt Cardiac Project. They attended Heartfelt’s screenings done in the Bay Area. “We would observe and volunteer — and get a feeling for how the screening was done,” Mayo recalled. “Last year we did our first screening, we went to our first high school — St. Ignatius in San Francisco, where we screened over 150 students and staff,” she said. They collaborated with the Peter Patrick Madigan Antonini Foundation, started in honor of Peter, a 21-year-old San Franciscan who was about to enter the firefighter training academy when he collapsed and died while jogging on Ocean Beach in 2002. The screenings included both EKG and echocardiograms, which normally cost patients about $1,500. An EKG detects a heart’s electrical issues, explained Gable, and an echocardiogram takes a picture of the structure of the heart. The St. Ignatius screening found five students to be referred to cardiologists for a more extensive echocardiogram. “We referred them to someone in the area and will make sure there is follow-through,” Mayo said. Gable Heart Beats has focused on soccer players since the sport is an important part of the family’s life. Michael Gable was a soccer star growing up in Monroe, Wash., where he was one of the few bi-racial students, and he received a full athletic scholarship to St. Mary’s College. There he met Michelle, also a soccer player, who graduated from Foothill High. Gable noted that they began to coordinate with BUSC and RAGE after sharing their vision with two board members. Saturday’s screening covers 100 of the young soccer players for free and is charging $40 for another 100, ages 5 to 18. 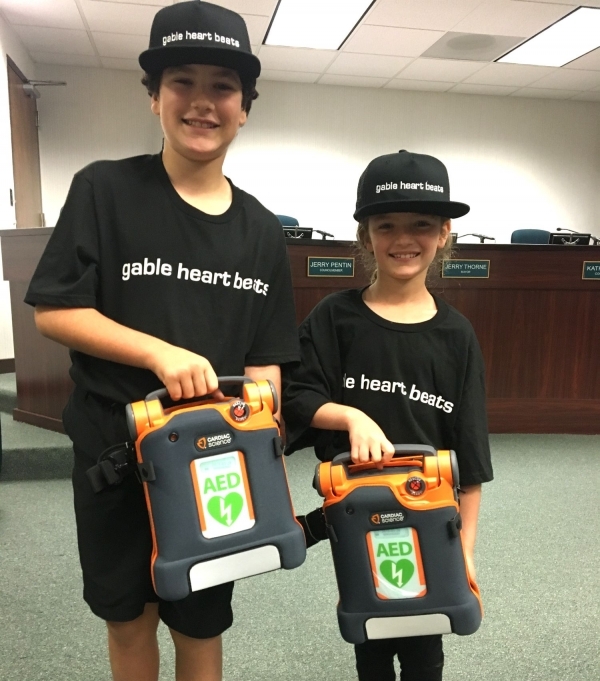 In November, Michelle, Matteo and Grace were recognized at a City Council meeting when they donated two AEDs to the city. “My kids were able to hand over the AEDs to the mayor, and they are being installed onsite at the Sports Park, at the snack bar,” Gable said. The ability to donate AEDs and provide screenings, of course, necessitates fundraising, and the fifth annual fundraising event — a dinner, silent and live auctions with live music — is being held at Crow Canyon Country Club. “The first one was held at St. Mary’s, then it was at my house for three years,” Gable said. The event also will feature speakers, this year including Matteo and Grace. “Michael must be smiling down, so proud of these guys,” she added. Another fundraiser is sales of the album “One Race Human, a Tribute to Michael Gable,” which was produced by Segue, a compilation that includes Michael’s songs that speak to his passion for living each moment with love and gratitude. Michael was a singer and songwriter with the band for 15 years. It can be ordered at gableheartbeats.org. More also can be learned about Gable Heart Beats on Facebook, Twitter and Instagram. The Gable family will attend the heart screening tomorrow, as will Michelle’s parents. “It is nice to give more to the community that we live in,” Gable said. She is proud to be continuing a primary goal she had with Michael: rearing their children in Pleasanton, where Matteo and Grace attend Mohr Elementary. The family’s new goal is to prevent their tragedy from happening to others. Also research your medical history for sudden or unexpected deaths before the age of 55.